Train toys are not only the common toys most kids play, it is also an educational toy that promotes and enhances certain skills such as logical or reasoning, hand-eye coordination skill and fine-motor skills. It also brings back good memories of childhood as we want to share the experience to our children for them to be able to have a good foundation of a bright future ahead of them. But of course, you would not want them to have just any train toys. Give them the best one that technology can offer or provide, toy production such as the best Lionel remote train which is made by a well-known company who have been providing children fun, joy and excitement through different generations. Lionel manufactures so many children’s play-sets but most of their best-sellers and breakthroughs are with train toys and models. They sell different type of toy trains, from wooden, plastic, battery-operated, remote, etc. Those trains also have different categories or gauges. Their products are very known to be full of features and with great sturdy construction. It is guaranteed to last for a long time and most of which have high ratings, good reviews and a vast number of positive feedback in most eCommerce website and highly recommended by many train enthusiast or hobbyist. 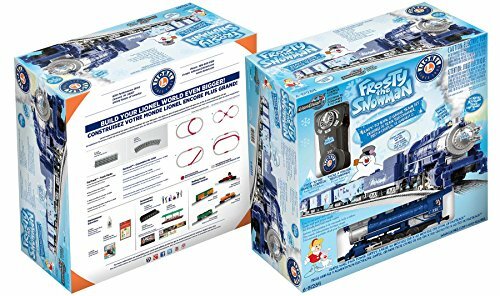 The Lionel polar express remote train set – o-gauge is a train toy creation inspired from the movie, The Polar Express. It features an operational headlight and puffs real smoke. It even produces sound from the original movie. This train uses the advance remote control system to provide young and old train lovers great and reliable control over the train. You’d see and feel the smoothness of how the train runs through the tracks with a real chugging, locomotive sound. It has a hazard free, smoke puffing unit. Can be bought with tracks or just the train unit. It includes 4 character figures of the Polar Express train. Engineered with a great remote control system. Can be used right out of the box. Train tracks of superb and stable construction. All for a reasonable and affordable price. It is an electric train where it requires you to have all the train tracks connected before it can be operational. The train light weakens over some time of playing. The train’s engine is heavy and sturdy but other parts are made of non-durable plastic. This is a top quality product from the long list of Lionel lines remote control train set. It is a preferable investment for your kids as well as adults who is about to start their remote train experience. For a reasonable price, it has more features to offer where you’d actually see your money’s worth. The Lionel Pennsylvania flyer o-gauge remote train set is considered to be the champion and king of train rails. It is a train with great power and runs incredibly smooth on the tracks. It has a low or none-at-all, tendency to derail. The set includes a large oval track with a dimension of about 40 inches by 50 inches. Each train cars included in the set has remarkable details and prints. The colors used are also sharp. The aesthetics alone can make you say that it is a remote train of great quality. It includes a train tender. This is a 0-8-0 train locomotive. Comes with a caboose and a train box-car. highly affordable for a train set with strong and sturdy construction. Great aesthetics and sound system. Can be purchased with an extra train tracks. Reliable train chief remote control system. The smoke stack or the puffing smoke feature does not last long. The train tracks offers a smooth ride but with a non-reliable durability. Sound system feature loses its quality on a brief period of time. 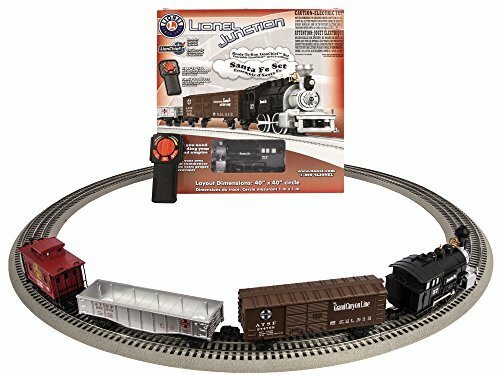 This is a great starting toy train set for beginners who want to start on a course of a great train experience or can also be a great Lionel Christmas train set g gauge remote control toy present for your young relatives or friends over the holidays. 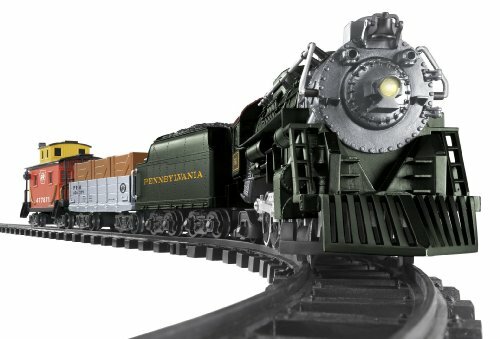 As expected from Lionel, this is another great Lionel Pennsylvania flyer remote control train set to be added to your collection. It is a highly detailed G-gauge train set fully packed with authentic sounds, headlight, freight cars, stable train tracks and a remote control feature. This is an affordable train set from Lionel, good for starters, trainiacs, collectors and hobbyist. The design is user-friendly where the remote button markings can easily be maneuvered to move forward, backward or be put on halt. Train design is of Berkshire style. Highly detailed. Great aesthetics. High end features such as remote, real train sounds, bells, whistles and a working headlight. Includes different freight cars such as couplers, crates, gondola, etc. Train tracks and remote control batteries are included. This type of Lionel train is not manufactured in the U.S.
Small sized train and freight cars. Other than the engine, all parts are made of plastic. Having few disadvantages, this amazing Lionel Pennsylvania flyer remote control train set still holds great ratings and remarks for countless satisfied customers. It is an affordable train set that is great to be added to your collection. The easiness of how you use, set-up, play and control the whole set is relaxing as you play for hours. This is another inspired creation of the Polar Express train from Lionel. It features the magical Christmas train experience of the iconic express train. It is a complete set of train cars, engine, train tracks, remote control, headlight, sound and more, all that for a great, reasonable and affordable price. It is a best-seller train set in amazon having remarkably good ratings of 4 over 5, an indication for a low cost train set that meets most customer expectations. It includes a free train tracks with an oval dimensions of 50 inches by 73.2 inches. Can be played with right out of the box. Easy to assemble/set-up and easy to use. It has remote speed settings. The train can be controlled to move forward, backward or stop. The train set features 3 freight cars, sound, headlight and a non-derailing train tracks. Reliable train set functionality for a low and great price. The remote control needs 3 pieces of triple-A batteries and you need to purchase it separately. The train tracks are not at all durable. It also does not lay on the ground firmly and stable. Often derails out of its tracks. 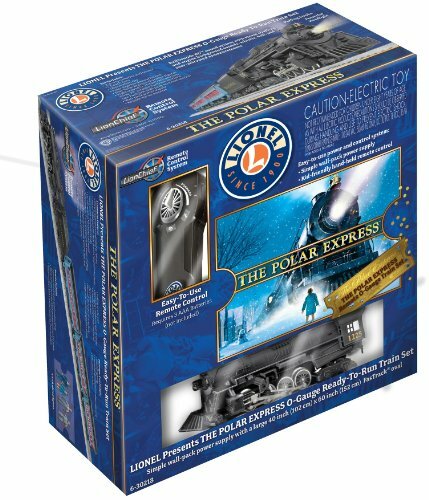 The Lionel Polar Express Ready to Play Train Set is not on the list of the expensive train sets but can closely compete when it comes to features and functionality. It can entertain you and your family as it runs smoothly across the oval shaped train track included in the set. This is a Lionel remote control train set where collectors must have their hands set. It is the right train to rail around your living room during Christmas. The color combination and the detail is top quality. It is easy to assemble and connect with remote control that is user friendly. It is one of the expensive sets Lionel made but the features, quality and durability is highly regarded. The smoothness and functionality are also of higher standards compared with their cheaper sets. It is a 0-8-0 locomotive, representation of and inspired by frosty the snowman. Includes a hocus pocus coal tender and a caboose. Figures include 2 bay hoppers, cake shoppe reefer and a traffic cop. It has a Lionchief engineered remote control feature. Loud sound system that plays frosty theme music and puffs real smoke. The sound quality is muffled and plays on a high tempo. Smoke puffed is unpleasant to the nose. 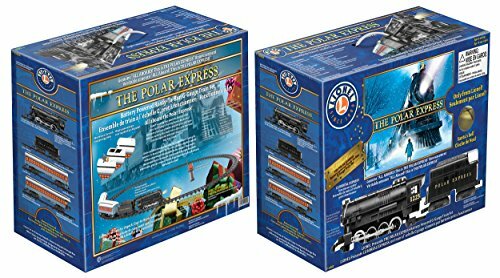 It is a must-have train sets for those who want to experience a fantastic and magical play-set playing the favourite Christmas theme song of frosty the snowman. This product is built with finesse and with great durability. It has some minor flaws in some aspects but most of which are tolerable or are minor issues. The product will provide you with a cheerful service for Christmas and many holidays to come. A quality train set for a great price having good sets of features. It will be great for your Lionel Pennsylvania flyer remote control train set collection or for your kids. As most train sets require, this train only needs minimal assembly. It is easy to connect, assemble and play with. It can give your kids a great deal of excitement and a longer time of fun and entertainment during play time, holidays or gatherings. High details using dark and sharp colors. It has a large oval train tracks with dimension of 50 inches by 72 inches. Includes 32pieces of durable train tracks. 24 pieces curved tracks and 8 straight tracks. Easy and with great control, remote system. Instantaneously goes forward and back as you press the button. It also has sound features that make authentic train sounds. Sound such as whistle, bell-ring and announcements settings are included in the remote control feature. Easy to assemble. Ready to play right out of the box. The train cars are hard to connect. It also barely able to attach with each other. It is nice that it includes authentic train sounds but there are no switches or control to turn it off. The sound feature has a fast tempo that makes it sound irritating. The price is reasonable for an average quality and feature train set. You or your kids can be able to play with the train set as soon as you get it out of the box as it requires minimal effort in assembling. It has some minor flaws in terms of connectivity but can still be able to manage. This is a good Lionel Thomas and friends remote train set to have. The train set is an O-Gauge train, inspired by Thomas and Friends or Thomas the Tank Engine. It includes the famous Thomas the Train coaches, Annie and Clarabel. It can be owned for a fair price, perfect for family, kids and train lovers who wants to start their wonderful toy train experience or to those who wants a quick set up of a fun train layout over the holidays for entertainment or additional decorative accessory under your Christmas tree. Electric Locomotive, Thomas the Train. Includes a forward and reverse movement in its remote control feature. It comes with 3 fun and removable faces with moving eyes of Thomas the Train. Includes Annie and Clarabel figures. Simple design but is built with great construction. The instruction manual is disappointing. It does not have any visuals or detailed instructions for an easy assembly. Remote control is not that durable. It is most likely to be the first accessory of the set to get broken. Engine is not that strong, the train moves slowly and it sometimes derails. This is actually a large train set, perfect to provide great joy to the entire family or a group of your kid’s friends. Though it has a an average train or engine power to move the freights at a higher speed, it is highly durable and last long to provide your kids with longer fun. 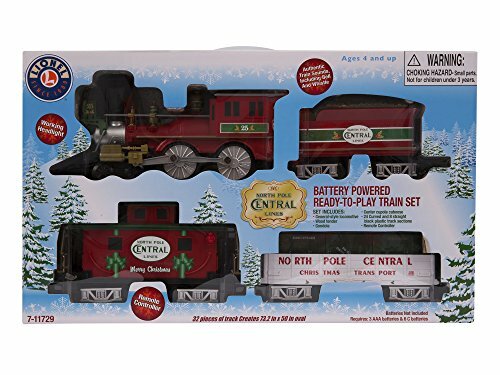 This is the North Pole Central Train by Lionel. It does have a nice color combination of red and green, the usual colors of a Christmas or holiday train set. The details are exceptional. It has great ratings and full of positive reviews on the most credible eCommerce website as it is very pleasing to watch and brings out the Christmas spirit inside the house. Great remote control feature that enables you to control the train’s movement. Battery operated train set. 6 pieces of C cell batteries for great power and longevity. Holiday themed design that are highly detailed and with a working headlight. Includes 3 pieces train cars. Ready right out of the box train tracks with 50 inches by 73.2 inches dimensions. The train set does is not a perfect fit. It has a high tendency to derail. All parts are made of an average quality plastic. Coupling requires you to remove the train cars off the tracks. It is a product makes the best features and pros out of the price it was intended. This train set boost the Christmas spirit of you and your kids as it runs around the living room, whistling and ringing its bells while simultaneously produces chugging train sounds. This is the G-gauge Lionel polar express remote train set. It is one of their affordable best-seller trains set with thousands of good reviews and positive feedback from joyful, happy and satisfied customers. Its design is intended for easy and convenient use. This is an inspired Berkshire locomotive that uses retro style and was made with remarkable details. This set is hoping to enhance your holiday experience and to expand the joy of your train adventure. Includes a coal tender and a steam locomotive. Train observation cars have opening doors. Figures of a boy, conductor and a disappearing hobo. Train tracks compose of 4 straight tracks and 12 curved tracks. Comes with a detail assembly manual which makes assembling effortless. Average engine power that is powered by 6 pieces of C batteries. Poor connectivity. Does not stay together too long. Train tracks are made of thin and, not at all durable, plastic. The tracks may come to you a little bit short and small but you can choose to purchase Lionel remote control train set extra tracks to extend the train routes and will provide you some extra fun. You can also use this train set as it is compatible with other strong and durable Lionel train tracks. Overall, other than the tracks, the train set is reliable, strong and could last for long. This is a farming inspired train set that will motivate your child to love both trains and nature. It teaches them how to transport tools and equipment that aids in the development of our land. 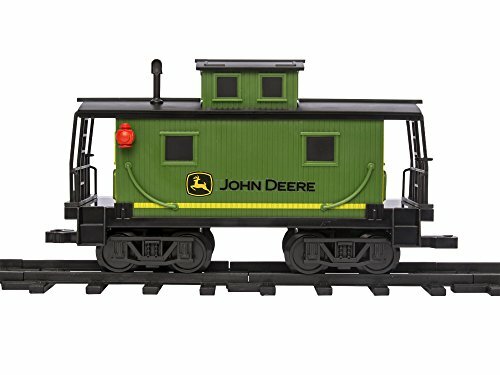 The train set color is green, appropriate for being a farm train with a label of John Deere written on all train cars that are included in the set. It is a John Deere locomotive that comes with a detailed and easy to use remote control for a great price. It has a ready to play, out of the box track having dimensions of 50 inches by 73.2 inches. Very detailed remote for easy control. It includes 3 train/freight cars and a working headlight. Powered by 6 pieces of C-Cell batteries for great train engine power. Remote control can go forward, reverse, turn on and off. 32 pieces train tracks are included. 8 straight and 24 curved tracks. Produces authentic sounds such as train bell, whistle and announcement. Not like with old model Lionel train that has metal tracks. Batteries for both the remote and the train are not included. Cannot survive a rough play style of kids. This Lionel remote control train set is more if a display entertainment rather than being a toy-set. It can give young children fun and enjoyable time through watching the train’s movement, train assembly and control but is not really built strongly for a beating of a child being a play-set. A Disney Lionel Train set created from an inspiration of children’s beloved Disney cartoon character, Mickey Mouse and friends. 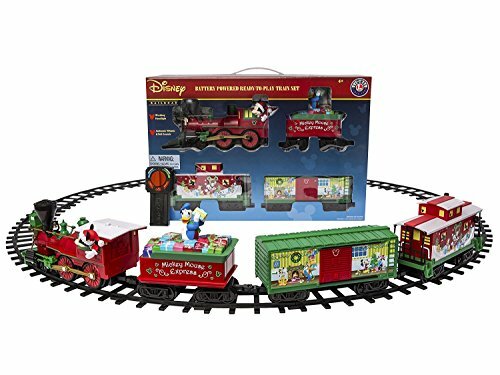 The train’s design is filled with fun pictures of mickey and his friends having a wonderful Christmas time. This will bring out the spirit of Christmas of your family as the train circles around the house as Disney announcement, whistles, bells, train chugs is heard. The train set comes with 3 pieces detailed Disney character train cars. Sound features with Disney announcement. Remote control is full packed with functions. Sound feature and train movement is included in the remote. 32 pieces train tracks in total. 24 curved and 8 pieces straight tracks. Working headlight that does not flicker. Oval train track dimension is 50 inches by 73.2 inches. Affordable and durable train set. Batteries are not included both for the train and for the remote. All parts are made of moderate thickness of plastic. No metallic parts at all except for the engine. Remote control can only do its function accordingly in a short distance. This is a perfect gift or present for your young relatives or kids. It does not only have the Christmas spirit in it but also includes beloved Disney characters most kids love. The first look can totally attract your children’s attention. It is also a fun way to spend the holidays to bond with your kids, trying to connect and build the train set and watch it circle around the tracks. It may be made of plastic but it sure to give your family a long time of fun. Another great, frosty the snowman themed train set from Lionel. It really brings about the frozen goodness with its design and color. A great combination of blue and white resembles the frosty season of the North Pole. It includes 3 train cars with frosty the snowman decorations, a frosty coal tender and a frozen ice cream train car. Remote control features has a clear and visible marked buttons that enables the user to easily control the train to go forward or reverse. It makes whistle and bell sound as well as frosty train announcement. The train set includes a cupola caboose, a frosty coal tender and a box car. It has a frosty general design locomotive. Durable, strong and made of sturdy construction. It plays a song and a great sound feature but not at all frosty the snowman theme song. Requires you to purchase batteries as it is not included in the set. Does not connect very well with its train cars. This is definitely a Christmas train as it does have an iconic Christmas design of frosty the snowman. 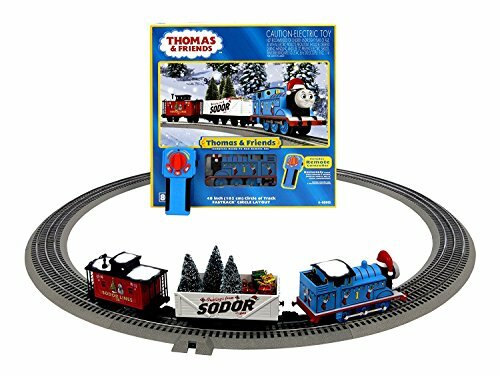 Kids will totally love this train set by the first look and would only cost you an average amount for a longevity that would bring long period of joy and smile for your kids. This is a Lionel polar express train set g gauge remote control train collection. It is not like with most of Lionel Trains that have a low price. This may come affordable to some but it is generally expensive compared with most Lionel train sets as it is more durable, sturdier, more efficient and great for train hobbyist, enthusiast and collector. Electronic Lionel train locomotive controlled by a remote. Comes with a bright operating headlight. Maintenance free, powerful train motor. Uses a traction tire for stability. Does not derail. Great design and color details. Authentic, smooth, powerful and clear sounds. Slightly expensive and does not include any batteries. Design is not intended for children. It does not have any form to which the kids can be attracted to. It is a train worthy to be collected by adult train hobbyist, enthusiast and collectors. It has high durability compared with most of Lionel train sets. It also has aesthetics based on an outlook of an adult and rather than that of a child. This train uses traction tires that makes it a perfect fit to its sturdy train tracks as well as making it more stable and minimizes the chances of derailing. Considered to be a great toy train and collector train for you and your kids, this O-Gauge train set is a great average priced toy train for a reliable performance and durability. It is featured with a remote control and a sound system to add comfort and fun. It is great for train lovers of all levels, being a beginner up to a professional collector. Gives you an option to purchase it with or without extra train tracks for a reasonable price. The whole set includes a gondola, box car, caboose and a diesel switcher. It uses a FasTrack with dimensions of 40 inches by 40 inches. The remote control feature enables you to control the train’s movement and the sound. Built with an operating headlight and sturdy construction. Poor train car connectivity. Not neatly engineered. All parts and accessories are made of plastic except for the engine. Train power not that strong. 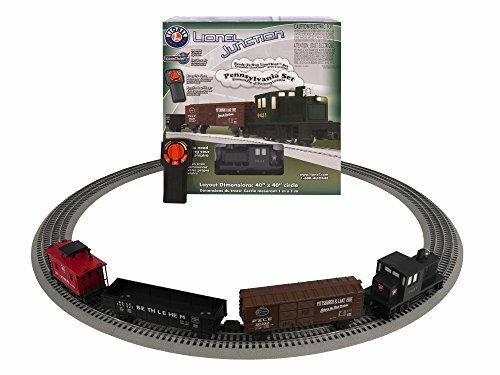 This Lionel remote control train set is a great for all ages. 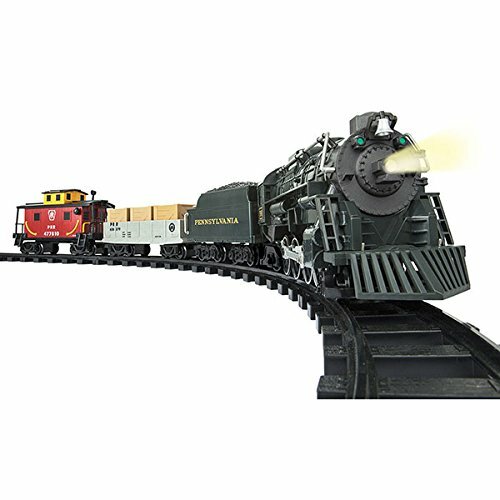 Kids and adults who love train can enjoy this high durable train set and expect it to last for a long period of time. It does not easily break, esp. the engine. The downside would be the connectivity but the plastic construction is not at all a bigger issue. Obvious as the image is, this is a train manufactured for the holiday in December. 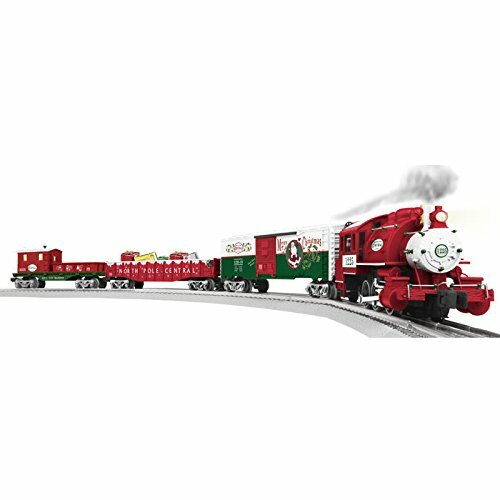 It is a train set that can either be a children’s holiday toy, a Christmas train collectible or an added decoration for your living room Christmas tree. It has a wonderful Christmas color combination of red, white and green. Uses a LionChief RC/Remote Control. Figures included a fireman and an engineer. The sound produces steam chuffing, announcement, whistle and bell sounds. Sound and movement are included in the remote feature. Incudes a very detailed instruction manual that also discusses troubleshooting. The clasps that hold each train cars cannot hold very well. Train tracks are not a perfect fit. This train set could work for you and your children for so many yearly holidays even thou it was intended for Christmas. The application of the design can set a good mood over different kinds of holidays. It is also durable enough to be working efficiently during all those holidays. A good quality train of the Lionel Thomas train remote controlled line of products. This is an O-Gauge train set of a Christmas themed Thomas the train. This is perfect as gift for your loved ones who loves train. Thomas the train has never failed to give a smile on the face of countless children and this train set will continue to do so. It has a removable Christmas hat feature. The great train with an outstanding engine can be controlled remotely. A FasTrack with an oval dimension of 40 inches by 40 inches is included in the set. Train sounds can also be controlled via the remote. Strong and sturdy train tracks for an undisturbed train ride. Oval train track size is small. It will result you to purchase train tracks to extend its course for an additional costs. The sound quality lowers after a short time of using. Other than the train tracks and the quality of the sound, this product actually has only minor flaws which do not affect the entertainment that much. The train can go smoothly along the tracks as it is almost a perfect fit and does not cause the train to derail. This is the Lionel Silver Bells lionchief remote control train set which is one of Lionel’s expensive train sets. You’d see the design and aesthetics are sharp, vibrant and elegant looking. It is actually a fast set that can be used right out of the box as it only requires minimal assembly effort. This is one of the decent high quality trains you can give your kids or to be added to your collection. It is easy to assemble, connect and packed with powerful and reliable power supply. User or kid friendly, easy to use remote control system. Remote features a forward and reverse, speed and sound control. 2-4-2 locomotive train with tender, gondola and silver bells. It is a good train set that puffs smoke as a kid’s toy or a decorative set during the holidays. The smoke is not that visible. It’s too thin. It also does not create smoke at some time. The sound system or feature is not that great. It loses quality fast. 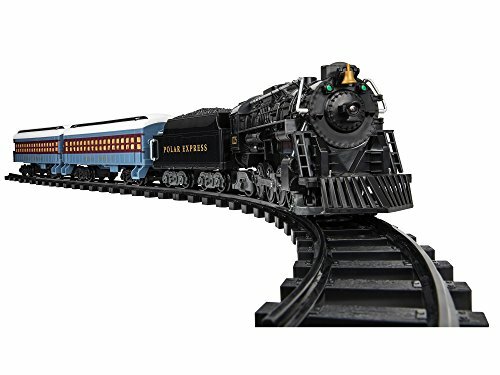 The Lionel Silver Bells Train Set can entertain people of all ages but the price can be a little bit expensive wherein you would not want it getting destroyed by young children’s rough play. It may however, be one of the greatest train to be collected by adult train hobbyist or enthusiast. Seeing the picture, it will really indicate that this train is a kid’s play set. The bright and vibrant colors are designed to attract young minds. It adds more flavor and fun. It is also an affordable set wherein you would not worry about your children playing rough with their play set although this Lionel remote control train set is made of durable plastic. This wonderful stock features a train with fixed couplers. All parts are made of strong, durable plastic. It has LionChief remote control features of train speed, movement and sound all packed into one RC. The set includes a diesel switcher, caboose, boxcar and a gondola. It has a very small train tracks dimensions given that the set only includes 8 pieces. This won’t last that long if your kids are not being careful with how they play as it is made of plastic and weights light. This is a train set, Lionel intended for younger kids. It can give them the fun they need but would possibly need replacement as they grow. For the price Lionel has set, it is actually a great set that can greatly entertain your children over the holidays. Trainiacs, hobbyist and collectors must grab hold of this amazing Santa Fe Steam Train Set from Lionel. It lacks the aesthetics that pleases a child’s eye but it definitely catches the attention of adult train lovers. It showcases a classy, elegant looking train with high quality details. It also is an averaged price train set that is reliably durable and guaranteed to give you a good time. Can be bought with extra tracks to lengthen the fun. It is a 0-4-0 locomotive that includes a bobber caboose, gondola, steam switcher and boxcar. FasTrack dimension of 40 inches by 40 inches. 7 O36 curved tracks and1 O36 straight track. Puffs real smoke and makes different train sounds. Child and user friendly remote control with sound features included. Made of great and durable construction with maintenance free, powerful motor. Smoke has a foul smell. Train tracks are short and small. WIll cost you extra for batteries that are not included in the set. 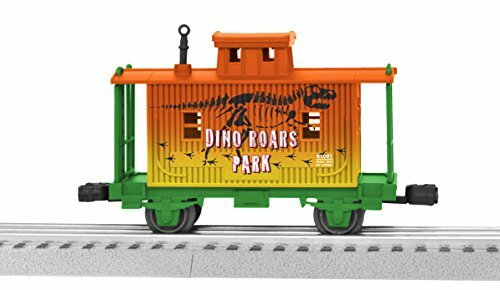 This train set can be a good play set for kids but ideally, the design, style, aesthetics and the price is intended for an adult play or for collection. You wouldn’t want a high priced train to experience a rough play of a child as it will be expensive to replace once it breaks. It is designed for a kid’s wonderful play-set train. More importantly, as you can see with the colors used and the design, it is an ideally train set for little girls who loves the idea of a train fun. The combination of blue, purple and pink creates a girly impression. For an affordable price, your kids, regardless of their gender, can have a great time assembling and playing around with this train set. Made of durable plastic and built with great engineering skills. The durable train construction comes with fixed couplers, diesel switcher, caboose, gondola and a boxcar. Lionchief remote control features that includes 3 buttons for the horn, bell and announcement. Full packed with animal figures and a working headlight. Non-durable remote control with a small control range. Attractive only to female train lovers. Although it is intentionally made for women or young girls who are fascinated by trains, it can also be a good train set for children with different genders. It is a good and durable train set for a very affordable price, adding to that, it comes with figures and a remote control features. The Lionel peanuts Halloween remote train is not a typical train that targets the fun and joy of Christmas. It is a train set for November holiday with a color combination of green, orange, black and blue, colors that are usually seen during Halloween. 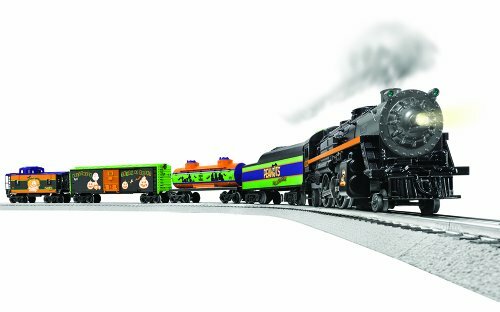 It is a fun train that is a perfect additive decoration for your Halloween party and can be a great train play-set for people of all ages. Great power supply that can give the train an efficient movement boosts. Includes a tank car, caboose and a boxcar. Train track layout dimensions of about 40 inches by 50 inches. Durable, neat and fun looking design. Train cars design is not very detailed. It is not an out of the box train as it is very hard to set up. Connectivity of train cars/freights is not reliable. For a long list of Lionel train products, this one you would probably want to have or to be added to your collection as there are only few Halloween themed train sets Lionel have manufactured or produced. It does not have remarkable detailed design but it is guaranteed to provide fun for so many November Holidays to come.